NZ needs to have the welfare debate because change can't happen without it. But when we have it, it becomes almost insufferable reading the claptrap every man and his dog comes out with. John Armstrong writes that the working group's prescription for change may be blinkered by ideology such as time limits. Perhaps worst of all, it makes assertions that are just plain wrong. 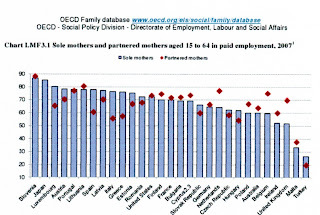 As part of the discussion paper's emphasis on getting beneficiaries into work, it cites Denmark, France, Germany, Sweden and Ireland as countries where, in contrast to New Zealand, sole mothers have higher employment rates than mothers with partners. 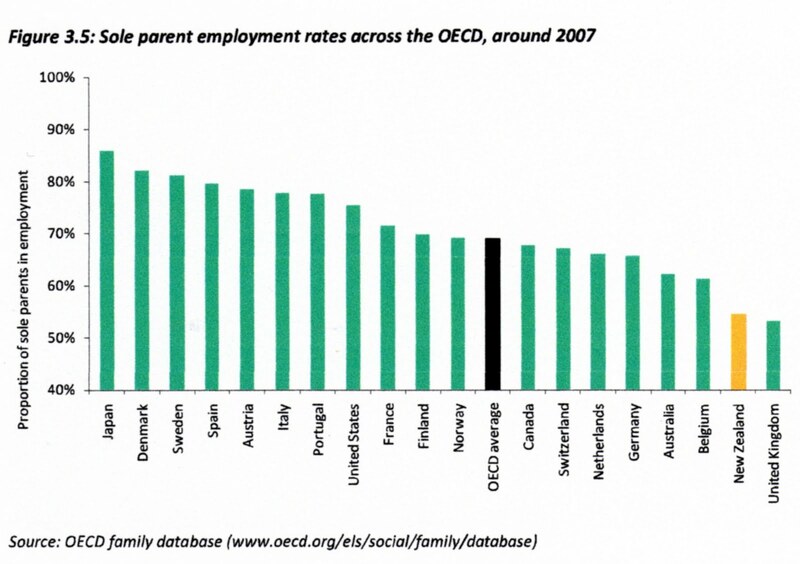 The OECD's family database tells a rather different story. In Ireland. 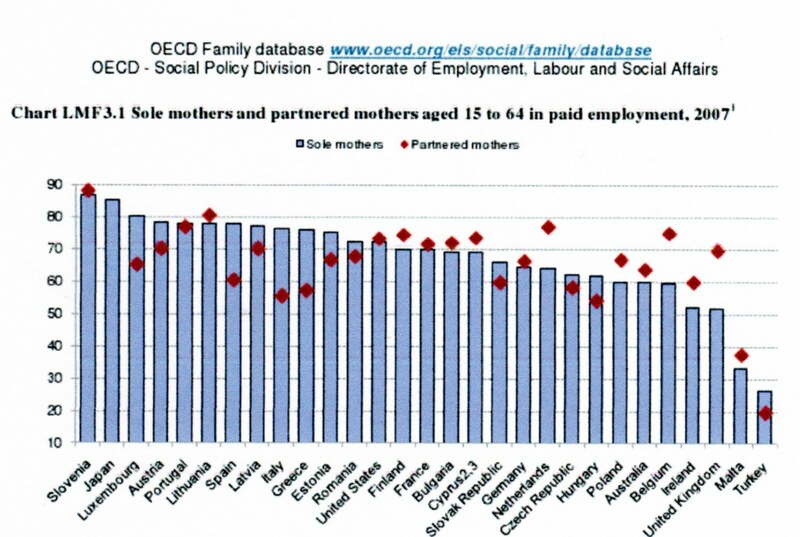 mothers with partners outstrip sole mothers when it comes to paid employment - as they do in France and Germany, though not by much. There is a time difference in the statistics. Unfortunately many of the statistics presented to the 2 day forum were outdated. (Not mine). 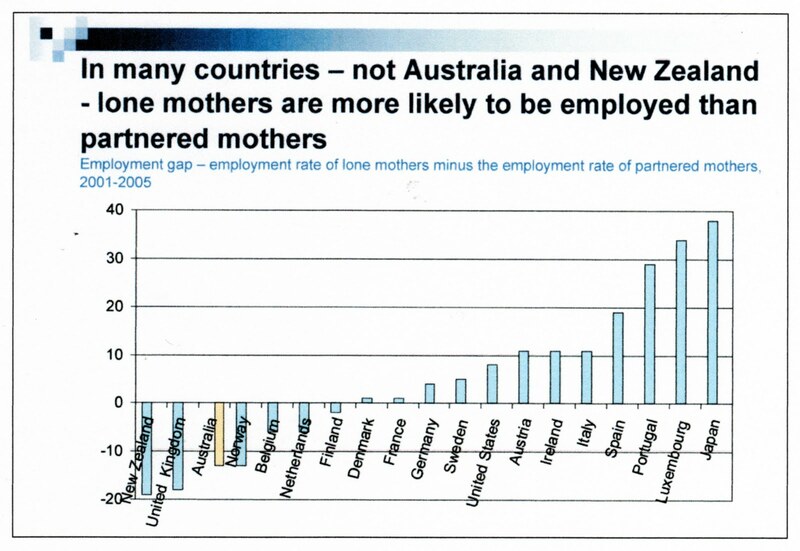 The fact remains that NZ has a low rate of employment among single mothers when compared with other single mothers in the OECD. That is an effect of the open-ended DPB. Quibbling about unintentional errors won't make that fact go away. Political management or political cop-out? But on Wednesday morning the Minister went on Breakfast TV to announce a "new" scheme, Home For Life. The scheme would see more permanency for children whose own parents could not look after them. Certainly a good news story with little political risk. The scheme has in fact been operating for a while. in care is a primary focus for Child, Youth and Family. new family they can call their own. says Ray Smith, head of Child, Youth and Family. are doing what’s best for the child,” he says. They've tried to put the fear of God into every right-thinking taxpayer by conjuring up the nightmare that if everybody currently on a benefit stayed on it for the rest of their lives, the cost would be $50 billion. And that's ignoring all the yet-to-be sick and unemployed and pregnant, bludgers who are queuing round the corner, waiting to sign up for their lifetime of sponging off the taxpayer. Shock, horror and pass the smelling salts. The discussion paper concludes "If current trends in benefit receipt continue unabated, 16 per cent of the working-age population could be receiving a benefit by 2050. The social and economic cost of this will be unsustainable." It forgets to mention about 16 per cent of working age people were on benefits for most of the 1990s, thanks to high unemployment, yet somehow we managed to survive without marching the beneficiaries off to work camps. During the 1990s a much greater share of the people on benefits were on the unemployment benefit. An annual average of 159,000 using end of year totals. On the sickness and invalid benefits combined there was an average of 63,784. DPB was pretty much the same as it is now. At the end of December 2009 there were 66,000 on the unemployment benefit and 144,000 on the sickness and invalids benefit. The numbers have pretty much reversed on the 90s average and the latter number is constantly growing. The sickness (often a gateway benefit) and invalid benefits, and unchanged DPB, harbour most of the long-term dependence. The future costs of people currently on the unemployment benefit are far less than the future costs of someone on the invalid's or domestic purpose's benefit. So the situation today is not the same as it was in the 1990s. Looking at point-in-time numbers or percentages of the population on a benefit only tells us so much. The Issues Paper addressed this by calculating future liabilities based on the current beneficiary population make-up. An exercise not previously undertaken. Long-term benefit dependence is growing and it grew in spite of the good economy of the early 2000s. How many times does this need explaining to people who refuse to take off their blinkers and stop carping on about "beneficiary bashing"? You know I actually agree that NZ can afford to carry on as it is BUT it will be to our economic detriment, and worse, to the detriment of the children and adults who never realise their potential in life. The left-leaning advocates, politicians and media are showing just how little they understand or care about the big picture. That is true of some. But not all. Connie Raiwhara, who runs the Pikorua community house where Ms Heremaia attends a sewing class, said many sole parents had no qualifications and would not give up the benefit for a minimum-wage job. "A lot of our solo parents get well in the $700s. They are not going to go from $700 to $400," Ms Raiwhara said. "Even if you're in a fulltime job on $400-$500 a week [after tax], childcare is $240 a week. You're working to pay for someone else to look after your child. "Maybe they should put the wages up and maybe that would give people the incentive to go back to work." This explains why people stay on the DPB even during good economic times. And it's a rational response. Nobody has been taught that welfare is actually supposed to be a last resort. They haven't been taught about the ethics of citizenship or economics. They expect the faceless state to put money into their bank accounts every week. That's just the way it is. And when I think about that phrase it was also the title of a Bruce Hornsby song from the mid-eighties and referred to coloured people being unable to get jobs due to racial discrimination in the US. Not quite the same problem as we are seeing in NZ today. According to The Standard the Welfare Working Group's Long-term Benefit Dependency; The Issues paper is about creating an "air of crisis" where there is none and as usual "Tory welfare bashing". Their latest post is a selection of quotes. So I thought I would pull out some of my own extracts and tables. At the end of April 2010, almost 13 percent of the working age population was receiving a benefit. Of the people who were on a benefit at the end of June 2009, more than 170,000 had been on a benefit for most of the past ten years. This graph should ideally show columns that are decreasing in height from left to right. 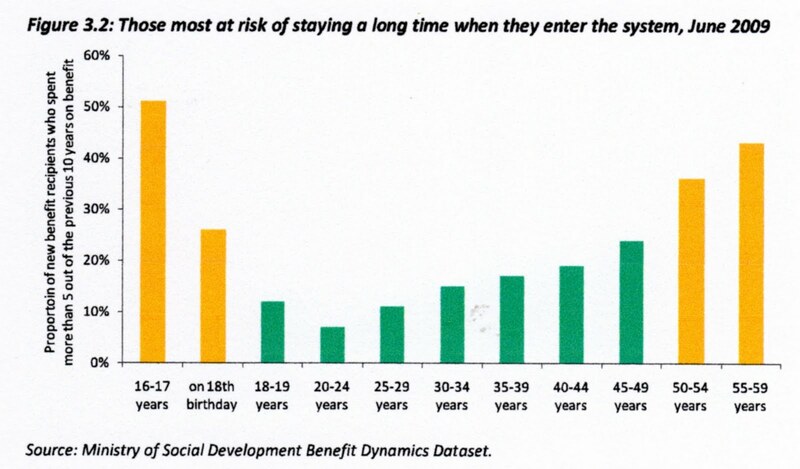 The numbers of people that are entering the benefit system at a young age each year (and remaining there) is significant. Each year around 5,700 people enter the benefit system at 16-17 years of age, and a further 4,600 people enter the benefit system on their 18th birthday. How many of the 4,600 entering the system on their 18th birthday are graduating from their caregiver's benefit? ... among young Māori women in their twenties, around 40% were receiving a benefit. This is a double whammy. 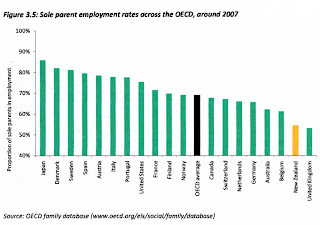 First, according to census data, NZ has the second highest percentage of children living in sole parent households in the developed world and second, nearly half of the parents don't work. No. There is definitely nothing here that should cause alarm. (Here is a comment that has just be posted over there; The money paid out on benefits doesn’t just disappear, it’s spent on rent, food, power, phone… All of that money goes straight back into the economy, it’s really a subsidy for the whole of NZ in some kind of trickle down and around process. After completing an interview with Larry Williams last evening I listened in to the talkback response - all in favour of welfare reform - and then caught Wendy Petrie announcing that TV One would also be covering the Welfare Working Group Issues Paper, had talked to a young solo mum and had done some of their own number crunching which might surprise. So I tuned in. They led with the unemployment benefit showing, with graphics, that the duration of stays on it are not that long. Then they interviewed a sweet young mum who studies and has been raising her much loved child on the DPB but is determined to get off it and repay the taxpayer. First the paper is titled Long-term Benefit Dependency: The Issues. Paula Rebstock said yesterday that it is not about the unemployment benefit which has actually been operating quite well over recent years. The focus is on the DPB, sickness and invalid's benefit. 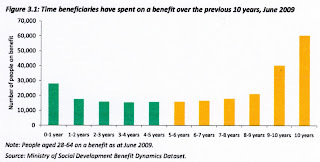 The report shows (3.6) that at June 2009 170,000 people on a benefit had been on a benefit for most of the last ten years. So for TV One to "number crunch" the unemployment benefit was just a dishonest disgrace. Second, the solo mum they interviewed is the exception to the rule. 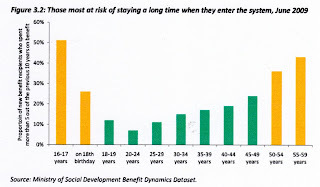 The report shows clearly that teenagers going on a benefit have the greatest risk of staying there long-term. That never got a look in. Repeatedly yesterday I heard the complaint that, there are no jobs or, the government has manufactured a crisis. 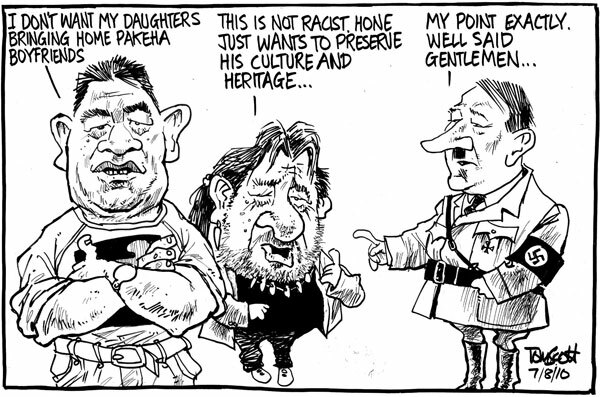 Shame on you Phil Goff. This is why you will never be Prime Minister. You don't deserve to be. Let's re-group here. Again, the report is about long-term welfare dependency and what drives it - the type of dependency that persists during good economic times. As it points out, in 1960 about 2 percent of the working age population was on a benefit. In 2007, after a period of very low unemployment, the figure was around 10 percent. Unemployment is only one factor driving long-term dependency and not even the most important. There are more people on the DPB than on the unemployment benefit. There are more people on the invalid's benefit than the unemployment benefit. Long-term dependence is about people having children with no means of supporting them; about making themselves unemployable through drug and alcohol abuse or unhealthy lifestyles; about a passive system that allows people to stay on welfare long-term. Crucially the report identifies that teenagers going on welfare is a significant factor and teenagers have consistently entered the system during good and bad economic periods. It is utterly defeatist to say there are no jobs so that's an end to it. The report, for the first time ever, has accurately described the dimensions of dependence and identified chronic dependence amongst certain groups. 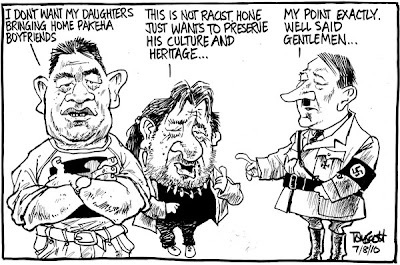 But those who are best characterised as 'on the left' are still in denial. 1. The rate of teenage dependency on welfare in the late 80s and early 90s, during a deep recession, was very high. Those people are not captured in the current one third estimate. 2. 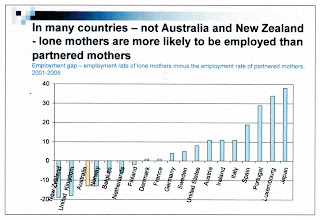 Many single parents stay on benefits for a long time. Over half of the people on the DPB spent at least 80 percent of the last ten year period (at December 2005) on welfare. The completeness of statistics aside, this whole business is very important because it shows that if the steady inflow of young people could be stopped the problem of long term dependence on the DPB would be largely diminished. But I see that the welfare working group is preferring to focus on promoting insurance for sickness and disability. Paula Rebstock has prioritised this for the media since the group was created. Employers may be asked to pay part of the costs if their employees have to go on sickness or disability welfare benefits under an insurance-based reform of the welfare system flagged in a new report today. Insurance is fine. But employers can't be expected to stump up for sickness insurance and pay tax for the state-provided sickness benefit as well (not to mention ACC). Or are we looking at another of the National private/public partnership ideas? I can hear struggling employers all over NZ groan as they read this latest bright idea which essentially tells them the government is going to punish them if their employees get sick. What about the responsibility of the individual in all this? Update; To be fair, the DomPost is reporting about suggested individual employee premiums. The Issues Paper is here. Took the kids flying yesterday. Sam took this from the ground after take-off. Originally she wasn't going up - "scared of heights". But once she sighted the plane and got caught up in the excitement Robert and I share she wanted first dibs (much to Robert's annoyance). We flipped a coin and she won. Always does. But the weather was closing in as I fiddled and faffed about familiarising myself with a plane I had never flown before. For instance their was no push-to-talk button on the control column so it took me some time to figure out how to transmit. Two tx buttons were on a second panel below the radio, which seemed blindingly obvious in hindsight. These planes are very old with updated electronics and nothing is ever standard. Consequently I only got one circuit in. Despite that Sam really enjoyed it except for when we were over the sea and I banked. Then she must have closed her eyes on landing asking me, "Have we landed yet? Have we landed yet?" Avoiding the rain, we went off to Burger King, the best way to mollify Robert when he is angry, now thinking he wasn't going to get to fly at all. After an hour the wind had gotten up slightly but the rain had cleared so we returned to the field and Robert got his turn. As we lined up on runway 34 and I applied full power my previously virtual-reality-only co-pilot commented, "The graphics and sound effects are much better." Flying is beginning to look more attractive to him than law. And I am pleased about that. It was a good day.